Valentino Rossi has had fame and success at an early stage and is a force to be reckoned with in the MotoGP series. He fought through to become the 125 and 250cc World Champion and has since been crowned the 500cc Champion. Rossi won his first title at the age of 15 in 1994, taught by his Dad, Graziano Rossi, one of the most popular Italian riders of the late 1970s and early 1980s. 23 consecutive podium finishes following the victory in the opening round of MotoGP in 2004, beating Giacomo Agostini's previous record which stood for an amazing 35 years. 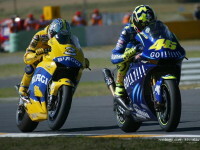 In was August 2002 in Czech Republic when Rossi last failed to reach the podium. 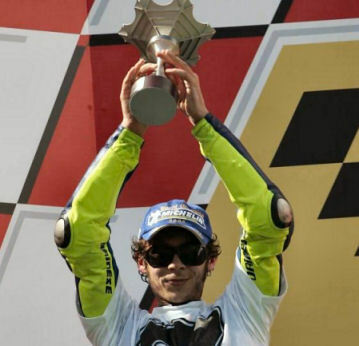 Rossi is in the top five all-time podium finishes in the premier class on motorcycle racing, including the opening round of the 2004 season, he has 55 podiums, 34 of which were victories. His next victum in 4th is Wayne Rainey. He is the first rider since Barry Sheen to win the opening round for four successive season, Sheen achieved it in 1976. '77. '78 and '79. He is the first rider in the series history to win back-to-back races for two different manufacturers. 1979: Rossi is born in Urbino, son of Italian GP rider Graziano Rossi. 1989: Rossi's motorsport career starts when he races go-karts, with his mother Stefani deeming bikes too dangerous. 1990: He wins a regional karting series in Italy with nine race victories. 1991: Rossi finishes fifth in the national karting championship in Parma, but by now he's also taken up racing mini-moto. 1993: Rossi begins road racing riding a Cagiva Mito 125 and claims pole position in Misano and scores his first podium. 1994: Cagiva boss Claudio Lusuardi gives Rossi a factory spec bike and he wins the title. 2000: Rossi quits 250 GPs and moves to Honda winning his first race at Donington Park before finishing second in the title. 2001: Rossi wins the last 500cc premier class world title with 11 wins. 2002: Rossi enjoys his best run of success in MotoGP when he wins in Jerez to spark a run of 7 successive vivtories and 11 in total for the year. 2003: Rossi helps Honda equal its own record with nine wins helping Honda win all 15 races before dropping the bombshell that he is to joi nYamaha. 2004: He wins on his Yamaha debut and takes nine out of 16 races to give Yamaha its first premier class title in 12 years. 2005: He claims11 wins, joining an elite club of five riders to have won five or more premier class titles in Yamaha's 50th anniversary year. 2006: He crashes out in the final race gifting the championship to Nicky Hayden. Rossi remains the most successful rider that year with 5 wins. 2007: After a promising pre-season on Yamaha's first 800cc YZR-M1, Rossi is embarrassed by Casey Stoner's Ducati, his worst season since his rookie campaign in 2000. * correct as at 19th September 2008.